Comprehensive review of Million Dollar Tan's Cabana Tan Sunless Tanning Lotion. See what real experts have to say about this self tanning product. Million Dollar Tan Cabana Tan goes on even but is challenging to rub in. This hazy white-colored lotion has no guide color which is good if you prefer applying your sunless tanner in the morning. The downside is that with no guide color you don’t know where you missed until 8 hours later when the color develops. The color changes gradually over the first few hours and washes easily off your palms. Overall, we have mixed feelings about Million Dollar Tan Cabana Tan. The color is natural looking and I even got compliments saying I looked “sun kissed” which is the ultimate goal of self tanning, right? However, it’s a little pricey at $32 for an 8 oz. bottle (plus they charge for shipping which adds another $6.95) and the smell isn’t very good. Overall we gave this product a rating of 2.75 out of 5 stars. Cabana Tan pumps out of the bottle as a white lotion. It has a thin consistency but a smooth feel. Million Dollar Tan Cabana Tan was one of the most challenging tanning lotion to apply that we’ve reviewed. It took a long time rubbing the same spot for it to even begin to feel like it was soaking in. Because Cabana Tan took so long to rub in , my skin felt wet for about 10 minutes. It wasn’t until the 15 minute mark that I felt it starting to dry. About 30-45 minutes after applying Cabana Tan did it feel completely dry. This s a significantly longer drying time when comparing Cabana Tan to other self tanning lotions we’ve reviewed. 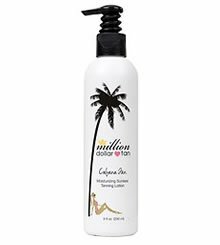 Million Dollar Tan Cabana Tan doesn’t have any trace of perfumes or natural scents added to the lotion. Which it could use, because the DHA smell is definitely apparent in this product. Definitely not digging the smell of this one. I woke up in the middle of the night and the DHA in the lotion was so strong it smelt like my skin was cooking. However, I showered when I woke up and the smell seemed to be gone. Unfortunately, it returned while I was at the gym when I started sweating. We really liked the final color that Million Dollar Tan Cabana Tan produced. It looks very natural and has a bronze glow. The color was even all over my skin and there were no streaks or dark patches where I had to do touch ups. It took about one day for the tan color to develop completely (like I said, the color is gradual). 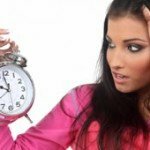 The color lasts about 4-5 days at which time you’ll need to re apply. We definitely recommend Million Dollar Tan Cabana Tan to men because of the great color. It will work really well for men who are looking for a natural look. 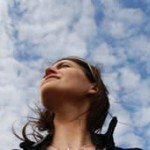 The only thing that might be a problem is that sweating brings the DHA smell back. We could see active men and heavy sweaters turned off by this. Cabana Tan costs $32.00 for an 8 oz. bottle, which equals to $4.00 per ounce. This price puts it in about the middle range of what self tanners cost. To buy Million Dollar Tan Cabana Tan Self Tanning Lotion, click here. « Who Started The Sunless Tanning Craze?